Kama property’s paddocks, currently being grazed for bushfire hazard reduction, may look rough from a distance but Swamp Isotoma was found in quite encouraging numbers upstream of the dam we see from Dungowan Street. These small blue-flowering natives have to wait many years from conditions to be damp enough for growth and flowering. Their presence there in October illustrates the point that we have to be patient, expect the unexpected and never call a species-list “final”. Duck were on the dam wall and there was a brief sighting of the more-unusual White-necked heron on the same wall. Acacia mearnsii (black wattle) is a November-flowering wattle with cream ‘pom-poms’ and dark green foliage. For me their perfume is un-wattle-like but others like it. There are a few in the forest’s mix but many more in the ‘plantings’ in the south of the reserve from 15-20 years ago. 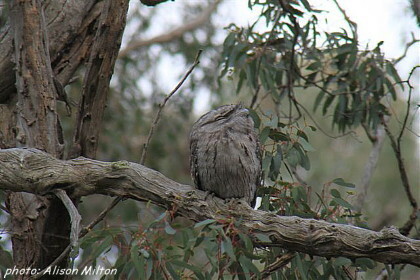 One old specimen on Mt Rogers is the daytime roost for 5 Frogmouths. Bursaria in the forest are all much the same height as the area was Hazard Reduction burnt and these plants are what recovered from this process. They’re prickly enough to shelter small birds from predators. Their white flowers attract insects; also good for birds. Cassinias are tough plants for forest or grassland and among the species we planted in early October. Their common name, Cauliflower bush, refers to the flower-heads’ shape. Fringed lilies didn’t show themselves in spite of our searching. John B. did find a few a day or two later, elsewhere. Not enough rain to trigger a purple display like last year’s. Goodenia hederacea was spotted by the observant. Often their Yellow, fringed flowers are surrounded by leaf-litter with the trailing stems and leaves more difficult to find at first. Hypericum gramineum is the botanical name of the native St John’s Wort. It has quite strongly-orange flowers that seem to follow the sun. It’s a late-flowering, low-growing forb. The Hawker-Macquarie area of Belconnen has been a hot-spot for sightings of Superb parrots in recent weeks. Intriguingly sightings have mostly involved males. Where are the females nesting? In which hollow trees? On which property? Will more arrive from NSW closer to Christmas as used to be the species’ tradition? In the high-country the Bluebell that’s the ACT floral emblem thrives. Other Wahlenbergia species adorn the Pinnacle Nature reserve, waiting for the sun to trigger the opening of blooms each day. The blueness of the petals is both eye-catching and cheering amongst the grasses and shrubs or even on harsh sparsely-colonised ground. John F was away at a Friends of Grasslands function and we missed his knowledge of the different Cranesbills. Flowers of the ACT and Region has a double spread of the possibilities, some native, most introduced and all with attractive blue, pink or occasionally white flowers and long, pointed seed capsules, hence the name. Looking deeper into the forest edge we saw a healthy, broad mass of Dianellalilies. Their pendulous, yellow-stamened-flowers are worth a closer look. Nearby was a Kangaroo-apple though we didn’t see the deep purple of its flowers until returning to the cars. Melichrus urceolatus have now lost their tenacious all-winter creamy-yellow blooms but are notable as low shrubs with prickly heath-like leaves. Wise to be dormant in the heat. Not to be outdone by the larger Paper-daisies there are many flowering clusters of Everlasting daisies. Some act as ground-covers whereas others are taller-knee-high. They’ve responded well to last years rains. The reserve’s nestboxes that were part of a PhD study into Indian Mynas are being checked for occupants to see if Mynas need removing. Quite a few of the boxes around the ACT now contain Honey-bees. On the Kama property edge of the Dowling boundary track there’s a plethora of weeds whose seeds have blown in on the prevailing winds (and come in on feet, paws and tyres). Those of us who weed in the forest have welcomed Bob's and Warren's recent attack on this long area with their scythes. Fleabane’s daisy-like, parachuted seeds are blown into the forest from this edge. Paronychia brasiliana, Polycarpon tetraphyllum and Plantago lanceolata are worth a Google hunt as they’re all common, annoying, introduced weed species. There’s a native Plantain which is common in forest areas with suitable soils but the first two are small-leaved, mat-forming invasives which can look convincing in disturbed areas. Both species of Pardalotes called, their songs penetrating through the forest’s leafiness. Questioning a healthy-looking thistle amongst the forest’s grassy space lead me to think it was a Native Hawkweed rather than a thistle. Picris angustifolia might help online. Rice flowers, Pimelea curviflora, are pale yellowy-orange and worth getting down for, with a hand-lens. They’re a gentle contrast to the show- yellow daisies at present. Rosellas were seen quite frequently during the walk and are busy nesting in hollow trees. Sorrel was attractively in flower in several places and is a widespread weed in the grassland areas. There’s a smaller native species, Common raspwort, which is similar and worth double-checking for in damper places. We found the remains of Stackhousia monogyna (Creamy candles) just in from the forest’s winding track. Swallows, Martins and Dusky Wood swallows hawked for insects over the paddocks. Tolpis tricked us into thinking this Hawkweed was a native. It’s a not-unattractive daisy found in disturbed areas. Proliferous Pink is also a ‘trickster’ though it seems to be less prolific than last year. It’s almost shocking-pink, a decadent colour some 50 years ago! The yellow, dandelion-like flower-heads of Flat weed and its smaller ‘relative’ Cats-ear contain dozens of individual flowers, each with 5 fused petals, a seed structure at the base and a tuft of ‘down’ that will help the seeds blow away when ripe. Beware of cutting-off or mowing these flowers hoping you’ve killed them. They’ll spend the time lying on the ground ripening into maturity and still be able to blow away to spread weedy-mayhem for next year. The plants have strong tap- roots which store food so the plants can re-emerge after, say, a burn or having the leaves destroyed. The growing rosettes of leaves spread out to take space from other plants. Variable Glycine plays tricks on me each year as my brain fails to absorb the names properly. Glycine tabacina emerges with leaflets, to creep over the ground, in late spring. There are purple flowers. Slender tick-trefoil, Desmodium varians, has small, pale-pink/cream flowers almost invisible. The semi-triangular seeds readily stick to socks, laces and fur. Weeders sometimes come across thin green stems twining up the weeds they’re targeting. The native Bindweed has pink flowers which wait for the sun and turn to ‘follow’ the sun during the day. Xerochrysum viscosum germinated in profusion from last year’s growth and the result is magical and inspiring. The papery bracts which surround each flower seem to reflect a yellow glow up into the trees. Butterflies and Hoverflies walk over the blooms seeking the reward of nectar for their pollinating services. Wonderful photo-opportunities! Yellow Rush-lily can easily be overlooked as the branched plants look grass-like or rush-like until the flowers open for each day’s sun and add lemon-yellow to the display. These plants ‘come-back’ readily after fire with root structures providing the necessary food. Zero tolerance for St John’s Wort in the forest is John B’s maxim. He is currently spraying the plants close to the ground especially the isolated young plants in the forest block. This calls for keen eyesight and identifying skills. Sometimes the plants have shiny beetles on them. They could be progeny of the Biological control agents which were bred-up and released a decade ago. Even though SJW is a significant weed both economically and in the country’s natural areas the Howard government withdrew funding from this biological-control project. Similar biological action against Paterson's Curse was also suspended. I suspect it’s only the differing patterns of weather and rainfall that have preventing us from seeing paddocks of purple followed by the present oceans of SJW yellow.